Sometimes less is more. 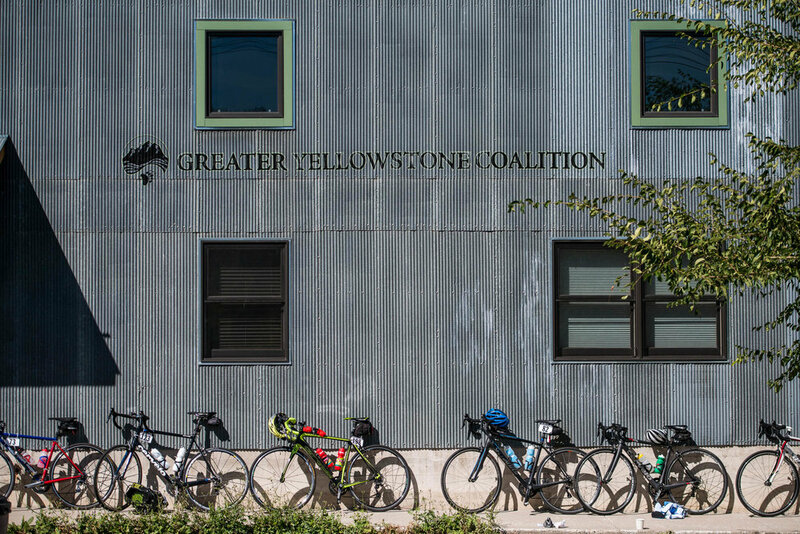 The 2015 Cycle Greater Yellowstone ride included snow, ice, hail, temperatures in the mid-20’s and grizzly bear patrols. The 2016 version of the ride offered more of what Montana is known for: big blue skies, majestic mountain ranges, roads that stretch towards the horizon and some of the friendliest people you could ever hope to meet. Brett Wartenberg and I flew into Bozeman, Montana which served as the starting point for the 2016 ride. Bozeman is the home of Montana State University and the Greater Yellowstone Coalition which sponsors our ride. The ride does not begin until Sunday morning. We decide Saturday is a good day for a warm-up ride to prepare for the seven days of rigorous riding ahead. We head south out of Bozeman and begin a long uphill ride into the Gallatin National Forest. A beautiful mountain steam runs parallel to the road from the reservoir at the top of our climb. We see a solitary fly fisherman working the stream. This is the area where many of the scenes in Robert Redford’s A River Runs Through It were filmed. We slowly wind our way up the mountain road until we arrive at the reservoir at the end of the road. After a short photo break, we plunge back down the mountain until we hit the outskirts of Bozeman in the valley below. We join 300 other riders for the start of the ride on Sunday morning. Our destination is Livingston, an old railroad junction which now serves as a magnet of sorts for celebrities who have vacation homes south of town including Meryl Streep, Dennis Quaid and Harrison Ford. We ride northeast out of Bozeman and begin a long climb up into Bridger Canyon. The road tops out at Battle Ridge Pass at 6,372 feet where cowboys and native americans reportedly fought in 1878. From here, we coast downhill towards Livingston. We pass through the Shields River Valley which the Lewis and Clark expedition passed through in 1806. We enter Livingston later that afternoon and camp in a park alongside the Yellowstone River. John Murphy at Lower Bridger School - an old one room school house along Bridger Canyon Road into Bozeman. After riding back to Bozeman the following day, our ride turns west. Our destination is Whitehall, population 1,038 which sits squarely in the Jefferson Valley. It is brutally hot when we arrive at our campsite at Whitehall High School, the alma mater of the late NBC newscaster Chet Huntley. We soon discover there are virtually no trees in Whitehall and we all scramble to find a shady spot. The downtown consists of two or three square blocks and has clearly seen better times. I find a dilapidated laundromat in town with a broken black and white television set on the wall where I settle in to do my laundry. We continue west the following morning into the Rocky Mountains by way of Pipestone Pass. Multiple railroads used the pass beginning in 1909 to travel from Chicago to the Pacific Northwest. The steady but not particularly steep climb up the pass goes on for over 20 miles. We are told that the Continental Divide cuts directly through the pass near it apex. I envision a majestic vista with boundary markers and abundant photo opportunities. Instead, I find that the Continental Divide is marked by an unimpressive wooden sign in a dirt parking lot with a few portable toilets and nothing else to see. We head down the pass through the towns of Divide and Wise River on our way to our campsite in Dewey beside the Big Hole River. Big Hole River, on the way to the "Dewey Bar"
Dewey has a name but it is hard to describe it as a town. It appears to consist solely of a general store that closed over 20 years ago and the one-room Dewey Bar. The primary business in and around Dewey is fly fishing. This afternoon, the bar is filled with fishing guides and cyclists with their laptops trying to take advantage of the bar’s wifi connection. Dewey is in “dark territory” in this section of southwestern Montana. There is no cellular service and the ride staff are joined by a team of volunteer hand-radio operators in order to maintain communications over the next 24 hours. This hardly matters back at the Dewey Bar. I grab a Coors and a basket of pretzels and sit on a bench on the porch of the bar chatting with a local television reporter from Bozeman who has joined us for the ride. Time passes slowly here and what is happening in the rest of the world outside Dewey hardly matters this afternoon. We continue west through an industrial area on the outskirts of Butte, Montana the following day and stop at Bannack, an old gold mining town that once was home to over 10,000 residents. Today, Bannack is a ghost town maintained by the State of Montana as a tourist destination. The town today includes a hotel, a one-room school house and a church. In 1864, Bannack briefly served as the capital of the Montana Territory. The remainder of our journey takes us through two other gold-mining towns, namely, Nevada City and Virginia City. Virginia City is the bigger tourist draw with well-preserved buildings that include music halls, soda shops and assorted eateries. I stop briefly for a soda in one of the local shops, knowing that a steep 3 to 4 mile climb lies ahead as we leave town. As I slowly wind my way out of town through a series of switchbacks, I see a male and female cyclist of the side of the road. Given the rigors of the climb, I slowly pull over towards the side of the road to catch my breath in the guise of merely being sociable. As I do so, the woman cyclist asks “Do you see the bear in the tree?” I instantly decide that rest can wait and turn back up the road at a cadence I did not think I was capable of achieving. The remainder of our trip takes us through the towns of Dillon and Ennis. We ride back to Bozeman on a sunny Saturday morning with the scenic Madison River at our side. My Garmin shows 490 miles of riding over the last eight days with over 17,500 feet of climbing. Brett tells me my climbing number is substantially understated. Brett and I have already signed up for the 2017 ride which will run from August 19 to August 25. The ride will begin in West Yellowstone, Montana and head west into Idaho. The ride will be shortened to six days with an optional rest day. On August 21, we will have a prime vantage point in the mountains of eastern Idaho to see a total eclipse of the sun. Brett and I hope you will join us. You don’t need to be fast. You simply need to focus on your endurance as you build up for the ride. Although this is primarily a camping trip, the camping is easy. For a modest fee, you will have a tent set up for you and taken down at each campsite. Hot showers, massages, good food, wine and beer are available at each campsite. You will stand in awe at the scenery that surrounds you and will make friends that return year after year. Brett and I would love to share this special experience with you.